Back in 2012, when Julie and I first started dating, I surprised her with a day trip down to Julian and we had a blast! 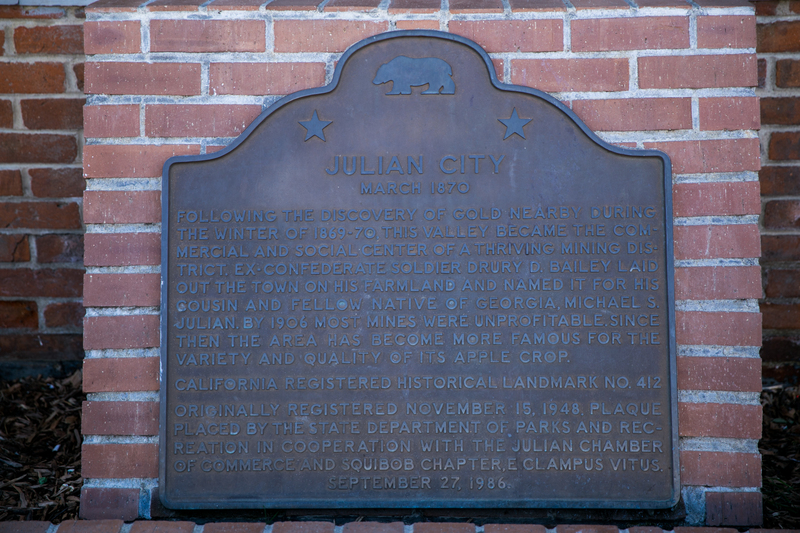 Four years later, we decided to return to Julian and explore it further. 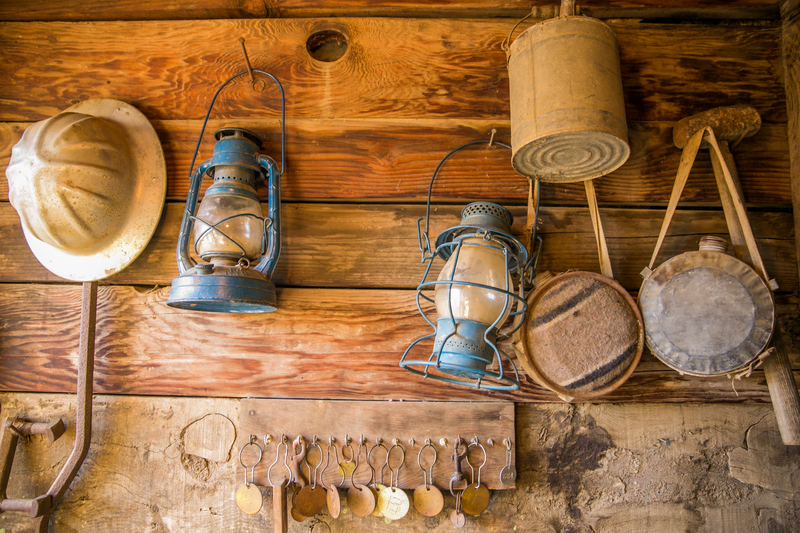 The town dates back to the 1870’s, and the days of the California Gold Rush. 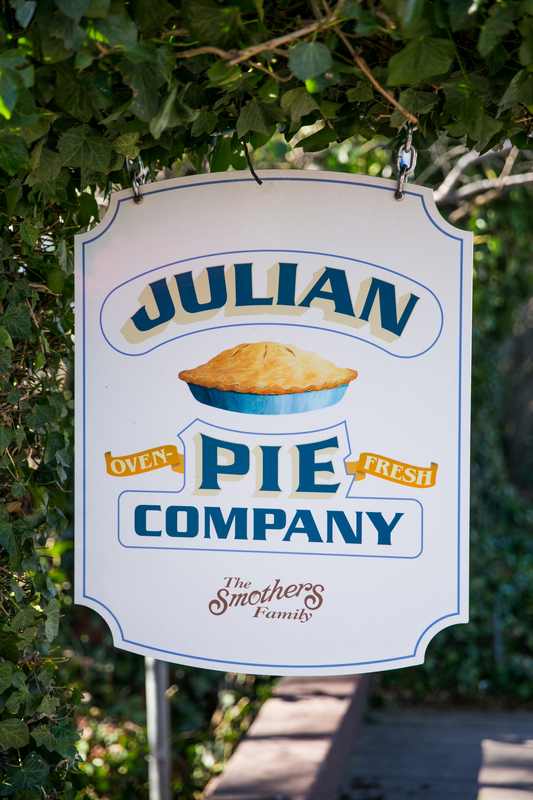 However, today, Julian is best known for its apples and the pies made from them. From Orange County, the drive down to Julian clocks in right around two hours and is just east of San Diego. 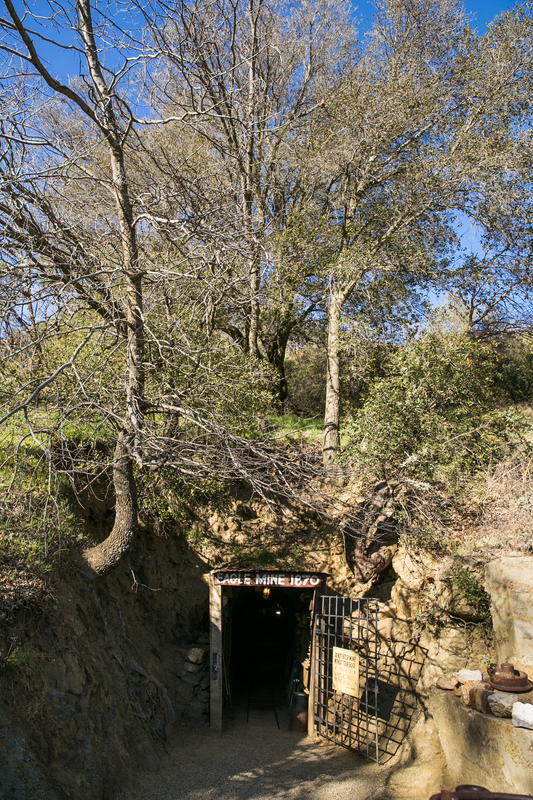 Its close proximity makes it a great destination for a day trip from anywhere in Southern California, or as an overnight if you prefer. On Saturday morning, we set out from our home and made our way south on the 5 freeway. I highly recommend getting an early start (9:00 a.m. or earlier) if you are planning to visit San Diego County, as weekend traffic can often be quite bad. Traffic starts to back up once you get close to San Clemente, and it is usually slow going until you get down to San Diego. Luckily, if you are heading to Julian you get off the parking lot that is the 5 freeway in Oceanside, and start heading east onto the 78 freeway. 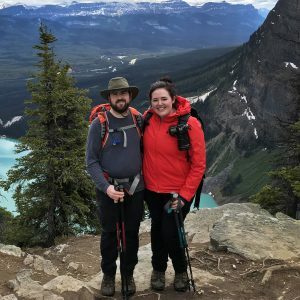 To break up the drive, we mixed in a few stops along the way, which allowed us to stretch our legs and cater to our foodie needs! 🙂 While scouring Yelp for dinner options on our drive home, I stumbled across a donut shop that quickly became a must visit. 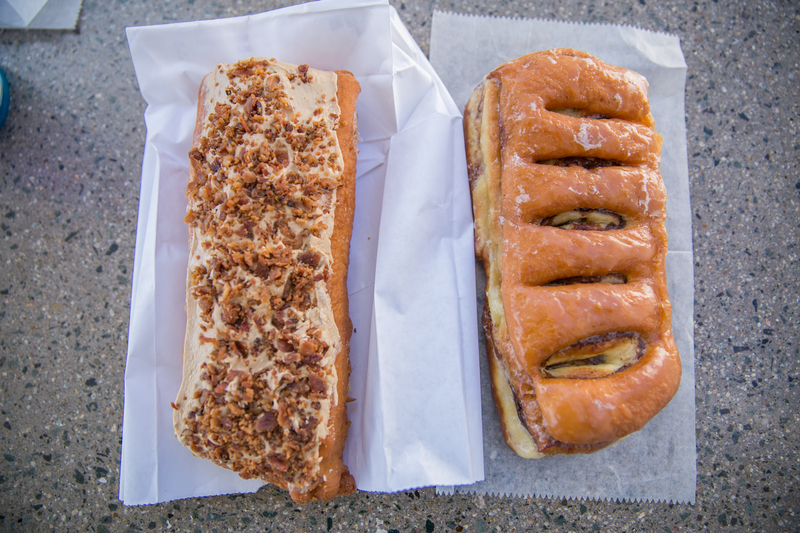 Peterson’s Donut Corner is located in Escondido and a short drive off the 78. 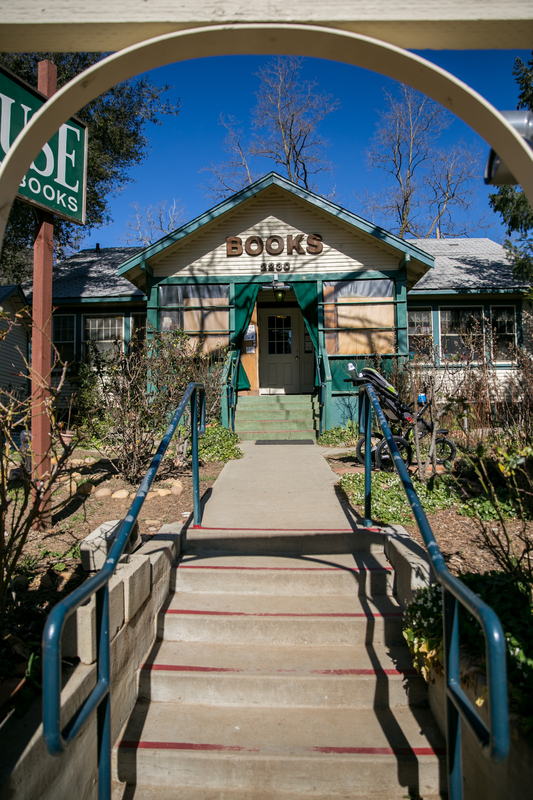 The shop itself is pretty unassuming and is located in a parking lot shared with a small grocery store. When we arrived, there was a small line of people waiting to order from the walk-up window. There are stone tables with benches just to the left where a few people were enjoying their donuts. 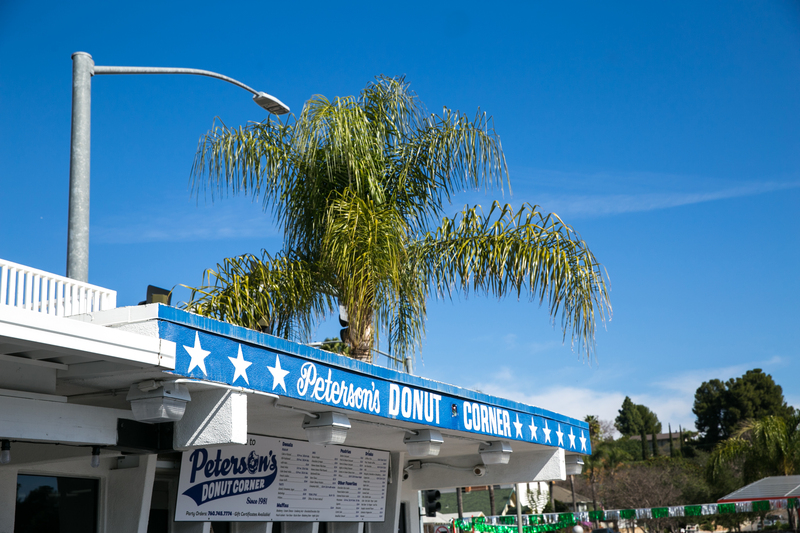 Donuts at Peterson’s are prominently displayed in the windows that adorn the shop, so if you’ve never been before like us, you can walk around and drool at all the amazing looking donut options. Since we didn’t want to be complete gluttons to start the day, we selected two donuts to share. Two giant donuts, that is. 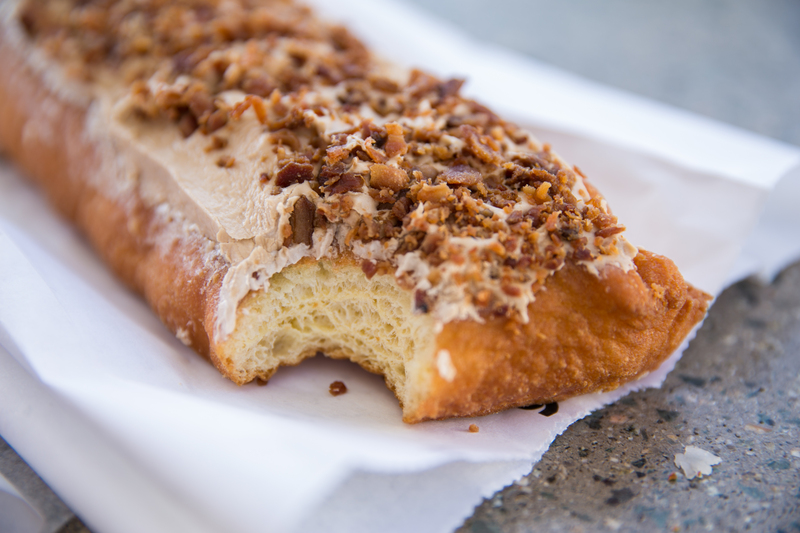 Since we both love maple bars and bacon, the maple bacon bar was an obvious choice. I also snagged a cinnamon, glazed twist as our second donut. Both were delicious, though it’s easy to become overwhelmed by the shear amount of sugar you can consume. A wise choice would be to grab a box to take home with you, but we settled for just two as we had more food adventures ahead of us for the day. Tip: Peterson’s only accepts cash, so make sure to have some on hand! 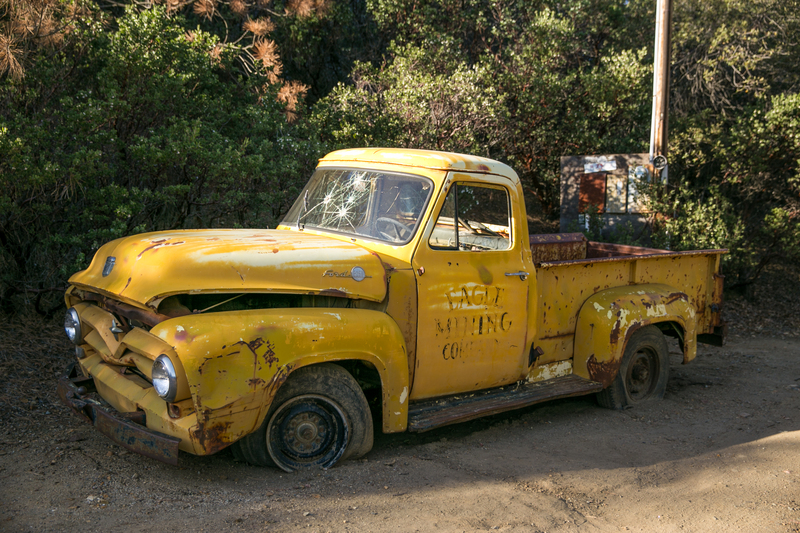 Fresh off our sugar high, we hopped back in the car and continued our drive to Julian. 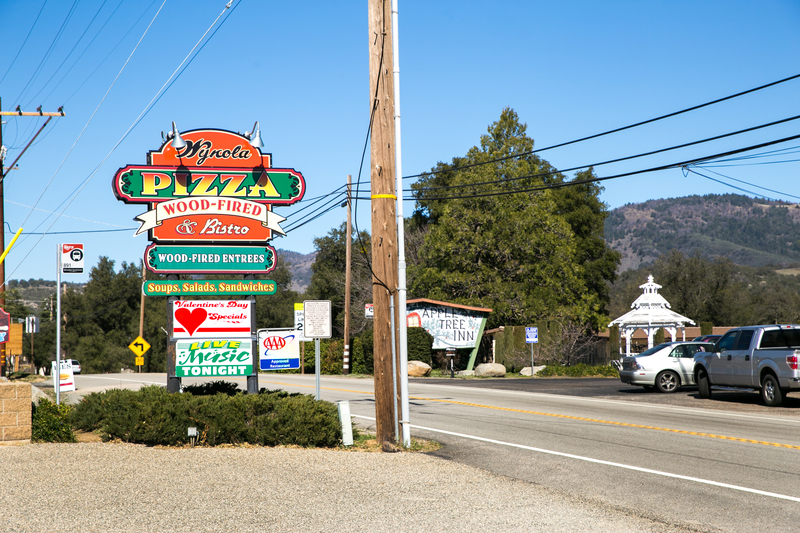 About five minutes outside of Julian is Wynola, a small stretch of food and drink options worth stopping in for. 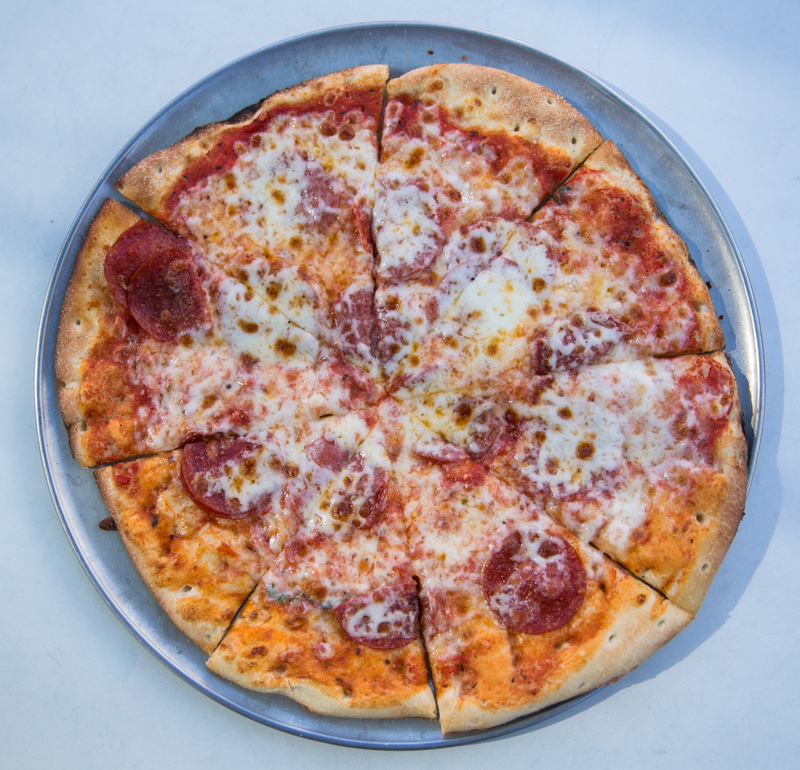 On our original trip to Julian, we ate lunch at Wynola Pizza & Bistro, which we stopped at again. Pizzas here are wood-fired and pretty tasty. It’s important to note that they only sell pizzas in one size, which was perfect for two people who weren’t starving. They of course have other options as well, including a good selection of beer and cider. Now, substantially more full, we headed in to Julian in search of the ever elusive parking spot! 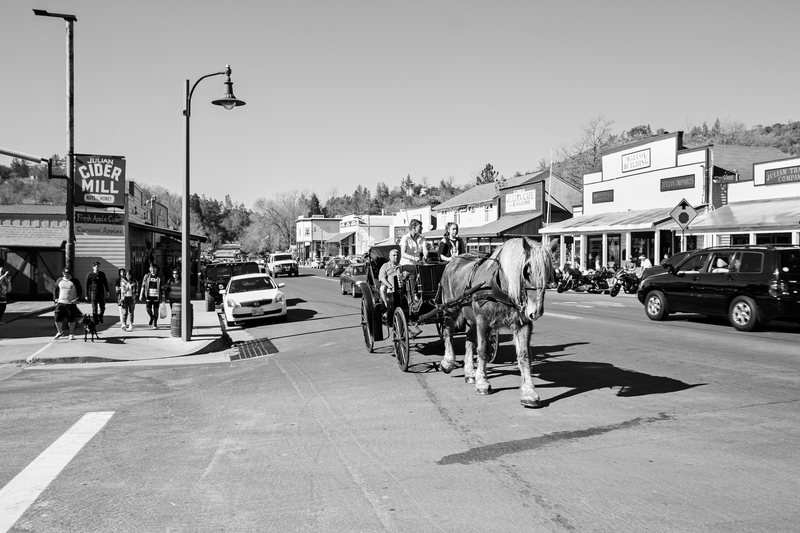 Main Street in Julian is devoid of many parking options, so it’s best to search for a spot on one of the side streets. 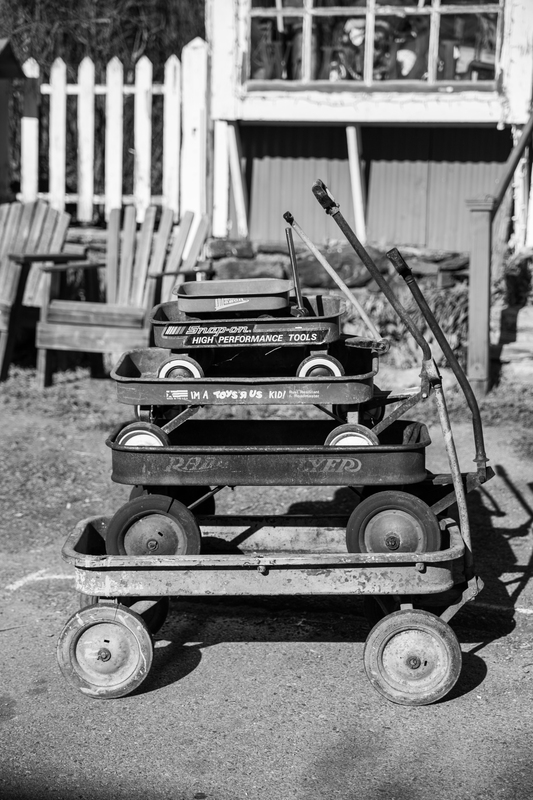 On a nice, sunny Saturday, Julian was busy, so parking was limited. We found a spot at the very end of the main road, just around the corner from the town’s single gas station. 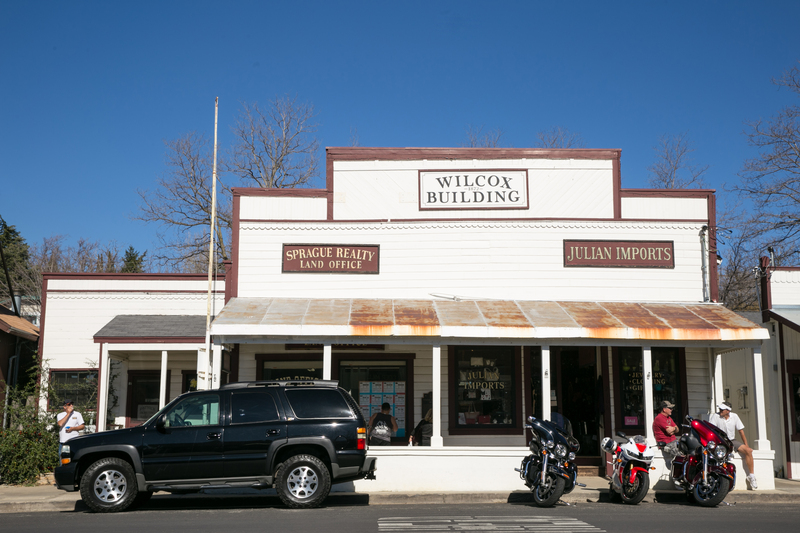 Walking down the street, there are numerous little shops and stores selling antiques and other items. It’s fun to pop into these stores and browse the items, though we didn’t find anything to bring home on this trip. 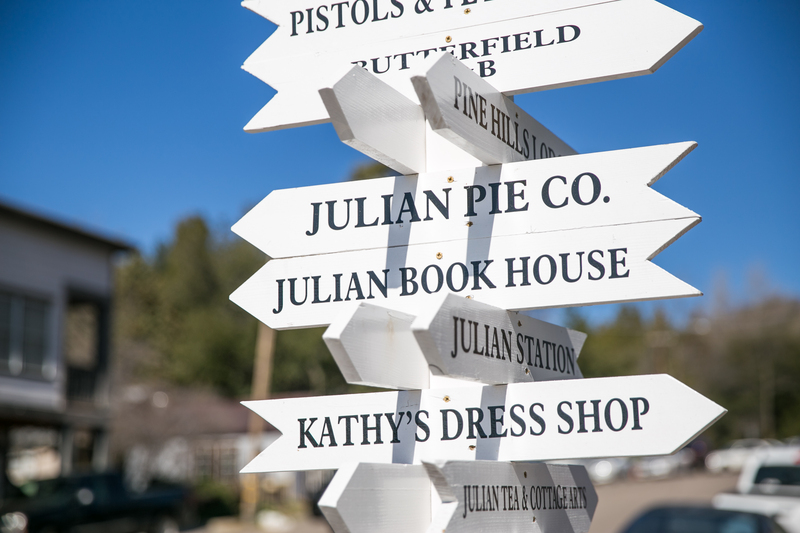 There are several places to eat along the main street, but the highlight here is pie, specifically Julian Pie Company. Growing up, I was never a big fan of pie, but my grandma made it for Thanksgiving and I would always have a small slice. Julie’s mom makes a pretty mean apple pie during Thanksgiving now, so we have a good base to compare to. Pie from Julian Pie Company is pretty exceptional and they sell slices and full pies. 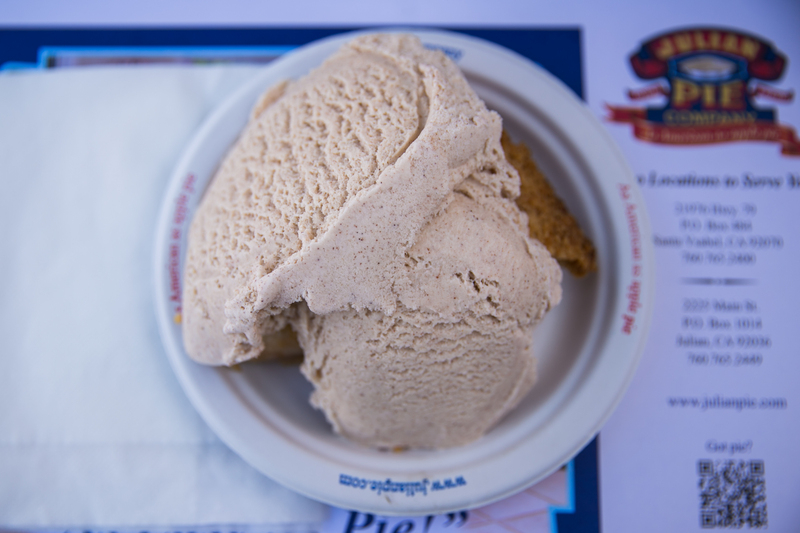 We chose a slice of the dutch apple with a scoop of cinnamon ice cream and it was delicious! We highly recommend it! 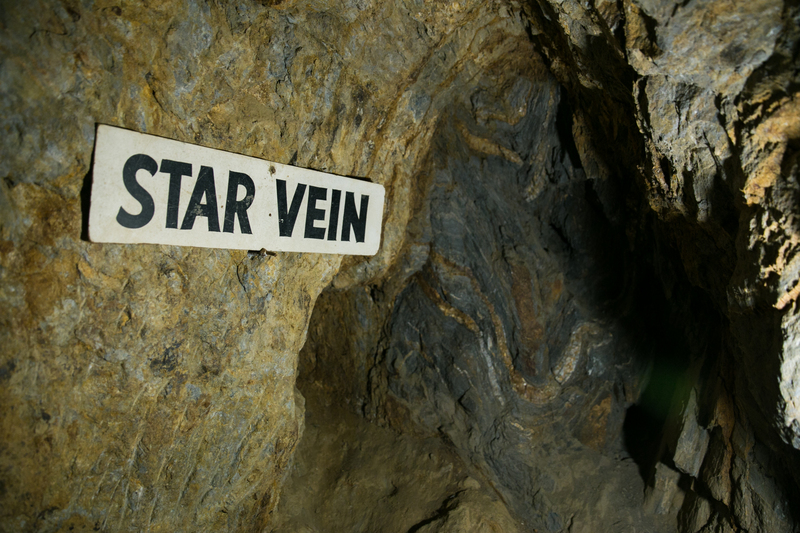 If you have room in your stomachs, Moms Pies is another option, but we skipped it on this trip since the line was out the door.After a quick visit to the Julian Book House, we jumped back in the car and drove up C street to check out the Julian mine tour. While initially a paved road, the path quickly changes to dirt and gets a little bumpy on the way down to the lot. It’s accessible for all cars and they will find you a place to park even if the spots are filled. 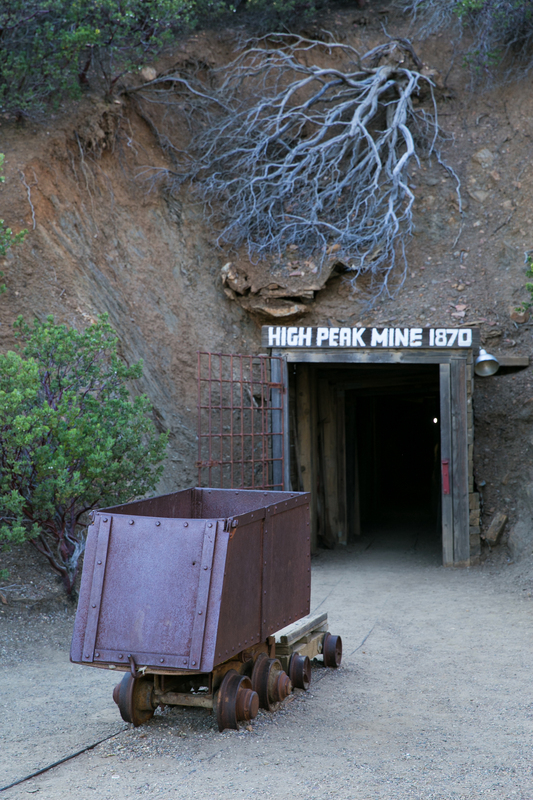 The Eagle Mining Company provides tours of the Eagle and High Peak mines which date back to the 1870s. Tours run between 10-4 during the week, and then 10-5 on Saturday and Sunday. Keep in mind, the tour is just $10, but they only accept cash, so be prepared since there are no ATMs on site. 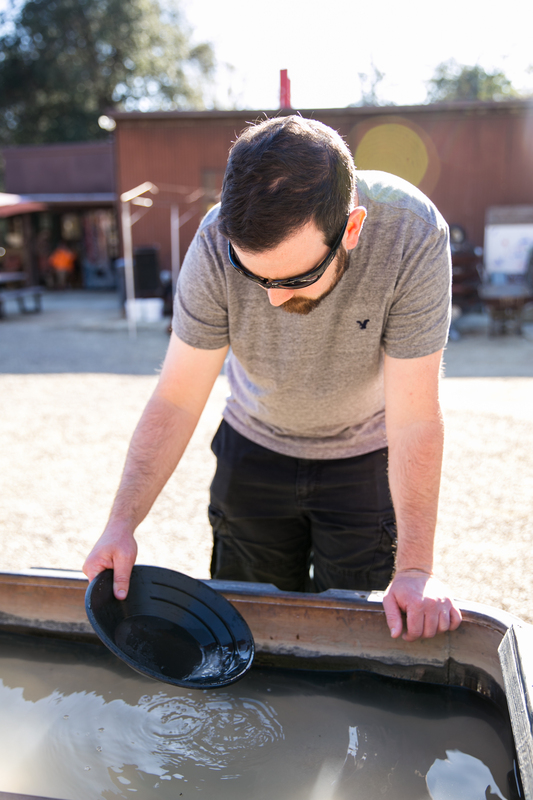 Your tour starts with a brief lesson on how to pan for gold before you get an opportunity to pan. 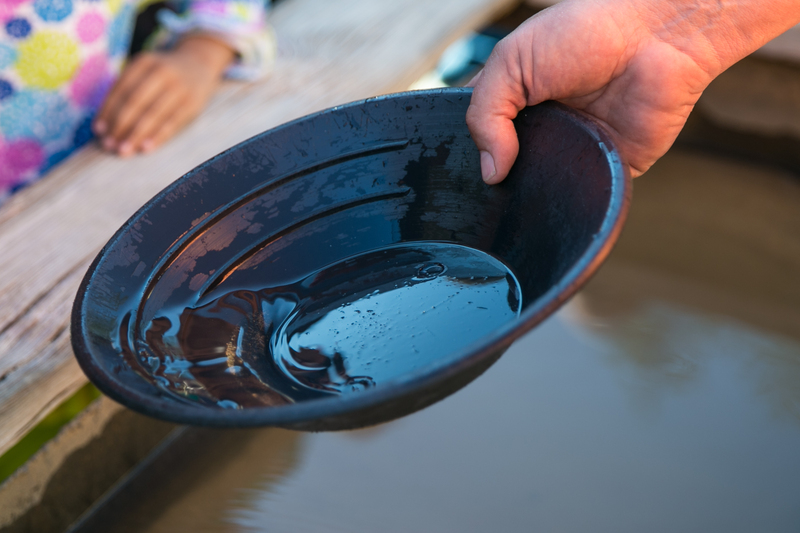 They keep small amounts of gold in the troughs and it’s fun to see the little flecks of gold at the bottom of your pan. 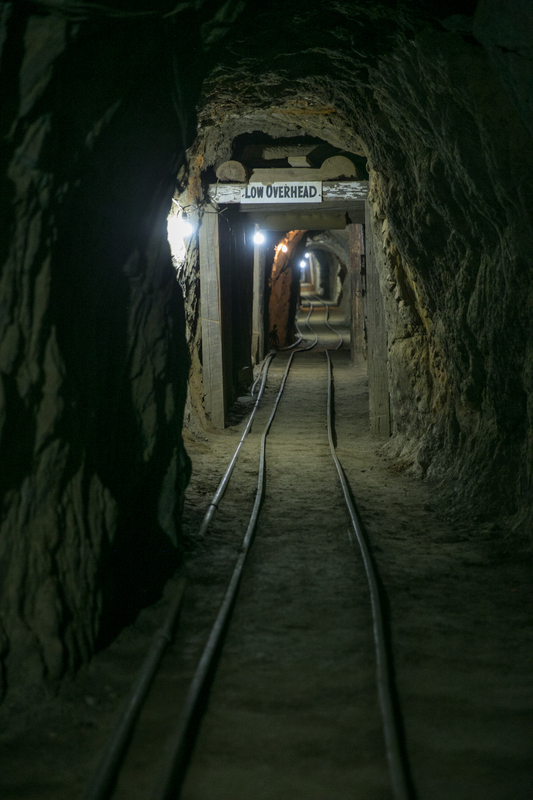 Next, the tour moves into the mines themselves and lasts about an hour as your knowledgeable guide covers the history of the mine and the discovery of gold in the area. 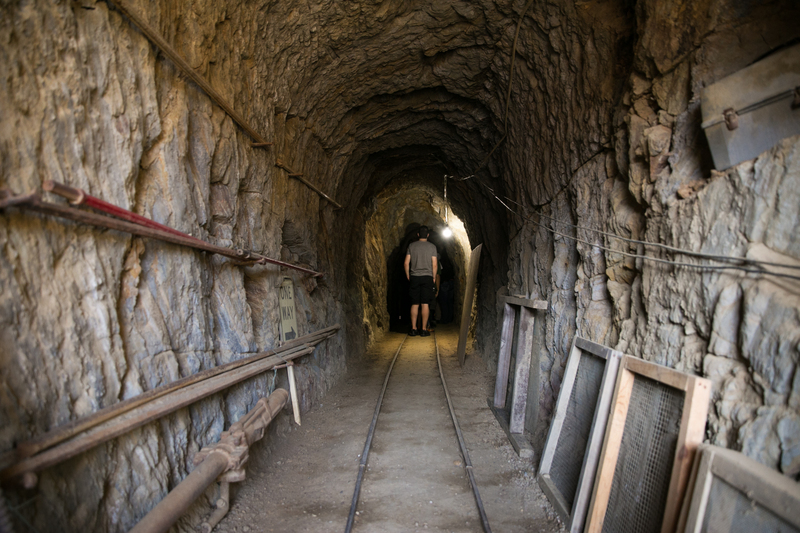 It’s fascinating how gold fever captivated so many people in the state of California, and the mine is in great shape. 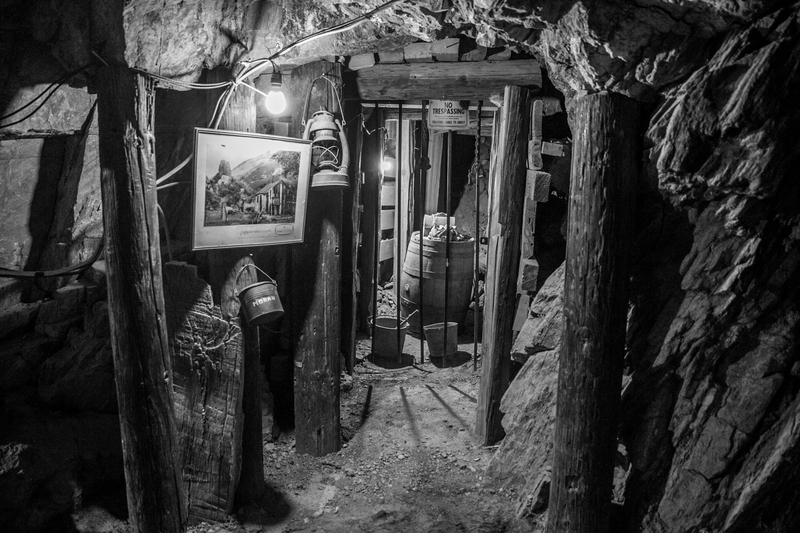 A fun fact about the mine that Julie and I loved was that the temperature within the mines always remains between 57-60 degrees, so on hot days, the mines offer a nice escape. 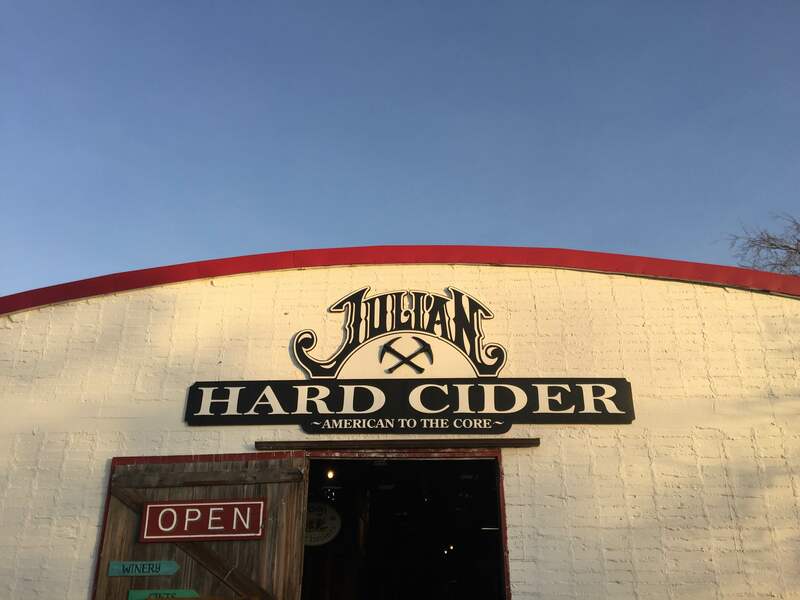 At the conclusion of the tour, we began heading in the direction of home, but not before stopping in to sample Julian Hard Cider at Julian Station. Julian Station, which looks a bit like a barn, was originally an apple packing house, but has since been converted. 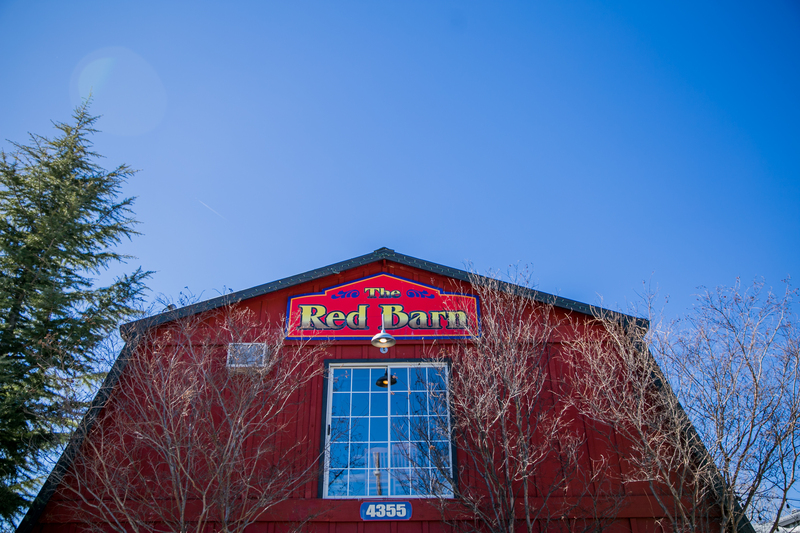 Today, you can find four tasting rooms (including the hard cider we tried) as well as a handful of boutique shops and Mr. Manitas Taco Bar. We enjoyed nachos from the aforementioned taco bar while enjoying a sampler of hard cider ($5) and then a pint each ($5 or $7 to take home the glass). Tip: Checking in on Yelp got us the sampler for free! 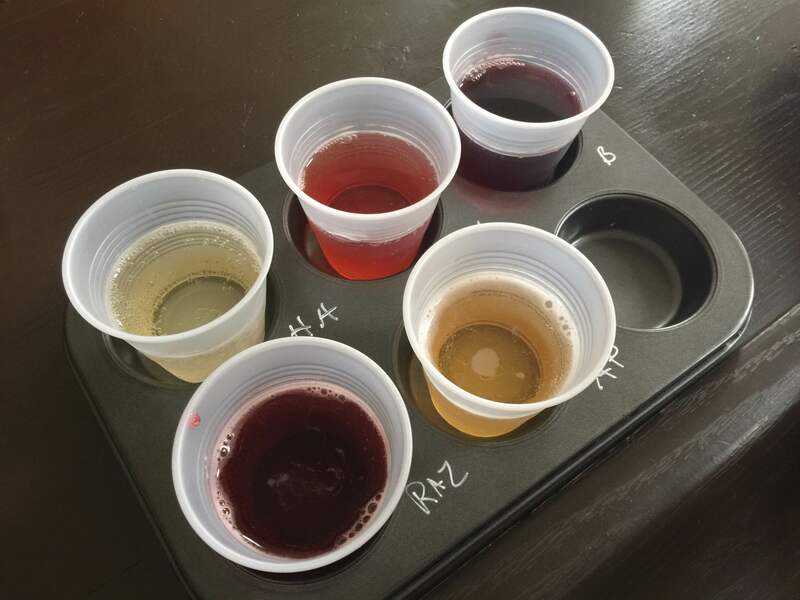 The hard cider was surprisingly better than expected, as they don’t add any sugar. It’s just apples and yeast, which provides a crisp and clean flavor. We picked up a couple bottles to take home and then were back on the road again. Though we weren’t incredibly hungry after the nachos, we decided to stop for dinner in San Marcos to try Sublime Tavern and Ale House, which is noted for their mac and cheese. On our trip four years ago, we ended our night at Churchill’s Pub and Grille, and had an amazing meal, but wanted to try something new on this visit. And while the mac and cheese was definitely good, we ended up wishing that we had returned to Churchill’s. 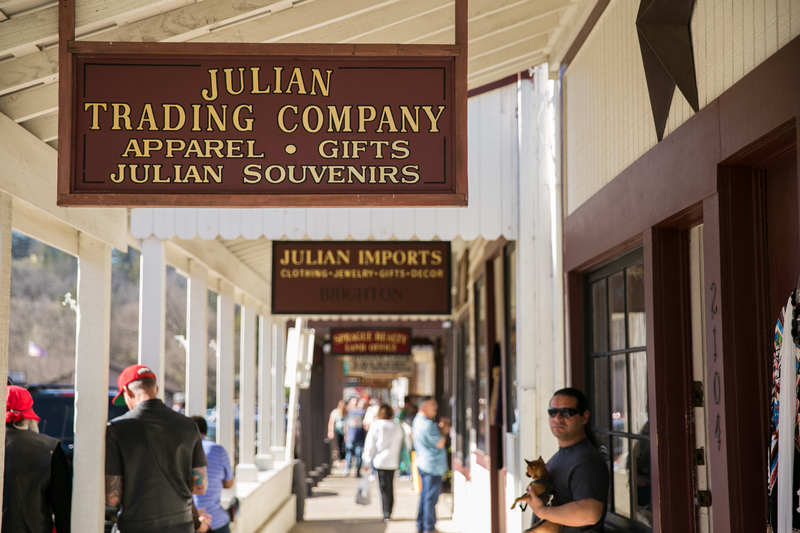 Julian is a great day trip from Orange County and can also be made into an overnight if you can score a room at one of several bed and breakfasts! 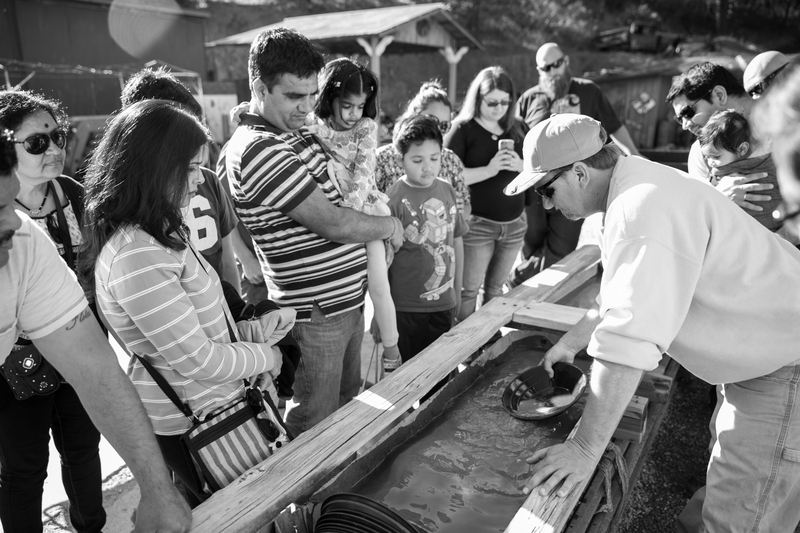 While you can visit year round, if you want to come for apple picking, fall is the time to go. 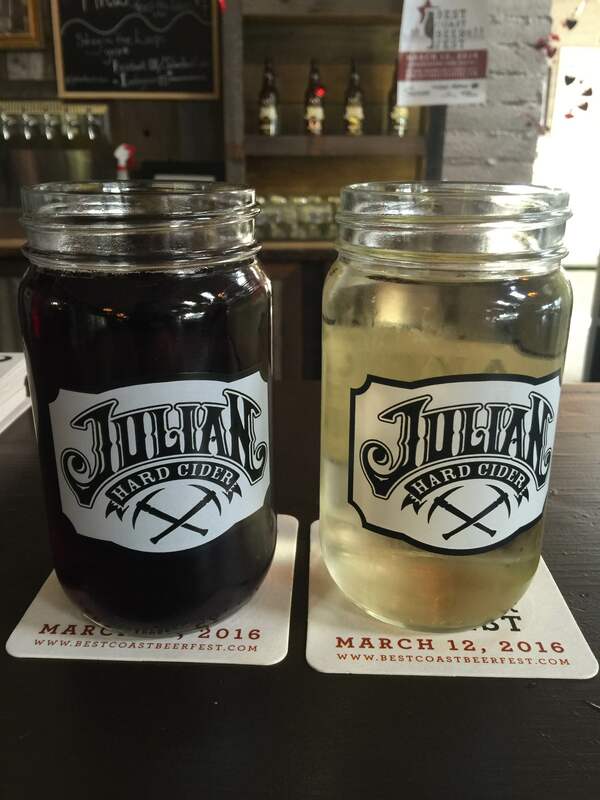 We highly recommend trying the pie at Julian Pie Company, and a visit to the High Peak Mine before enjoying a pint of hard cider.